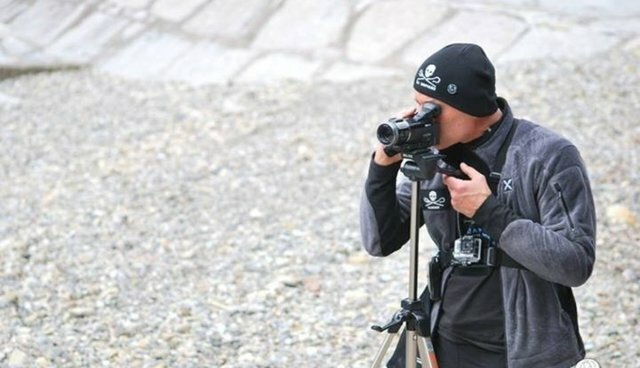 In recent years, one of the constants of the Taiji dolphin drive hunt -- along with slaughter and captive sales -- has been the presence of a small group of Sea Shepherd volunteers who are determined to bear witness, and to tell the world what happens in Taiji. Last weekend, Taiji fishermen drove some 250 bottlenose dolphins into the cove at Taiji, selecting 52 for sale into captivity and killing 41. Thanks to the Cove Guardians, word of the enormous dolphin drive, and video and pictures of what happened in the cove, brought world media attention to Taiji. But after it was over, and the media blitz died away, the Taiji fishermen went out the following day and rounded up another group of dolphins for slaughter. Journalist Tim Zimmermann checked in Thursday with Cove Guardian leader Melissa Sehgal on what it is like to be on the front lines of such a relentless and emotional confrontation with the world's most notorious drive hunt. You've been going to Taiji for a number of years. Was last weekend's bottlenose drive the largest hunt you've experienced? Yes, this is my third year on the ground and that was by far the largest pod I had seen driven into the cove, It was so massive that the killers drove it in 5 separate groups into the cove. The incentives seem to be changing and the fishermen are less interested in meat and more interested in dolphins for sale. Is that what you are seeing? Yes. Approximately 1,200 [dolphins] have been driven into the cove since September 1, when the season began. Of those, approximately 149 were taken captive. There was a significant number slaughtered, approximately 600, but there is an increase and definite interest in captive dolphins. We will see the killers chase a pod for hours and hours if it is profitable for captivity, such as bottlenose or Pacific white-sided dolphins. The were 52 dolphins taken captive from the pod last weekend. These dolphins, depending on how well trained they are could be sold for hundreds of thousands of dollars. So it's a multimillion dollar profit for Taiji. Do you know much about the brokers? There's three captive facilities here in Taiji. All three of them work as brokers. We have Hotel Dolphin Resort, which is quote-unquote a hotel that has dolphin shows. I've been on the ground three years and perhaps it is off season, but there doesn't seem to be much hotel business. The are making their money buying and selling these dolphins. We've seen them take so many dolphins captive into their above-ground tanks, and whether or not they are shipping them in the middle of the night when we are not watching them -- these dolphins are disappearing. Taiji Dolphin Base is another training facility that takes dolphins captive and sells them for much more money. They also have a "swim with" dolphin program and do dolphin shows for tourists there. And then, of course, Taiji Whale Museum, has approximately 100 dolphins and small whales on display, but they only have a few that are used for the show. The other pens are in the back, and not visible to us, and are used for training facilities and to buy and sell dolphins. The brokers apparently get anywhere from $40,000-$80,000 or more for the sale of a trained dolphin. Do you know what the deal is for the fishermen? What are the fishermen getting paid? The fishermen get a percentage of the final sale, which is minimal compared to what the brokers get. For dolphin [meat] the estimate is anywhere from $300-$900 dollars per dolphin, depending on the size and type. And at a minimum they are probably getting thousands of dollars for a captive dolphin? Can you tell me what you saw with regard to the albino? Immediately we saw the albino and we were all shocked. We just felt for this tiny baby that was clinging to his or her mother. And we knew immediately that the killers would take that dolphin captive, because it is rare. We did see that was the first dolphin that was taken and wrestled into the captive nets and dragged under the tarps. It wasn't the first one that [was transported from] the cove, so obviously trainers were there bidding on it, or poking and prodding. We did see the dolphin wrapped in a tarp and dragged out of the cove, still alive, and immediately put on a transfer truck and taken to the Taiji Whale Museum. We do know it is there in the front captive tanks where they do dolphin shows. We are able to see it swimming with a bottlenose and a Pacific white-sided dolphin. We are not allowed to enter the Taiji Whale Museum, and we are not able to take photographs, but we are able to see the dolphin in the captive tank. For you, to come back year after year, it must be hard to see this go on day after day and not be able to stop it, to only to bear witness. Tell me about the psychology and emotions for you and other volunteers? It becomes difficult. I've seen hundreds of slaughters. And we do have volunteers who come back each year. It is emotionally challenging -- physically and mentally draining as well. But for some reason we are able to separate our own emotions and be here for the dolphins because all we can do is document it and expose it to the world to the people out there who are not able to see what is happening. Via our Livestream we are able to reach hundreds of thousands of viewers. I get messages from people saying thank you because I wasn't aware this is continuing to happen. There are two different scenarios. People thought it ended after the movie "The Cove." Or, as we saw this weekend, people thought it was a one-time thing. They don't realize it happens for six months out of the year, every year. And that it has been happening for many years. How do you operate there? We currently have 14 Cove Guardians from around the world, all volunteers. Volunteers come at their own expense and on their own schedule. We stay in a hotel, so we are very limited. We give up comforts of our home and family, and things we are familiar with. It's a big sacrifice. It's a vegan campaign so we are limited with food supplies, and we often get care packages from loved ones and supporters. I'm here for a majority of the time. We do this because we all want to see this end -- we want to see the slaughter end here. We are up before sunrise. We're about 10 minutes from Taiji so are there at Taiji harbor [early] monitoring the boats. How many boats are going out? How many killers are on the boats? Are some of the killers staying back at the Fisherman's Union? Are they prepping for a transfer? We are keeping an eye on all that. Once the boats leave the harbor, and go out to sea, we are monitoring them. We are the first to Tweet or use social media, letting people know whether there is a drive once we see the boats are in formation and have found a pod. At times we relocate to a better vantage point and initiate the Livestream and continue Tweeting and posting updates on Facebook, and any photos that we can, letting people know what is happening here, what species is being driven, numbers, whether there are juveniles and trainers taking part. Details like that. Sometimes the drive can take up to several hours. Over the weekend the drive with the 250 bottlenose dolphins we were up here for 8 hours Livestreaming for five days in a row. We never know what to expect. We prepare for the worst but hope for the best. Once the slaughter is complete, we also Livestream the meat buyers. Meat buyers always try to hide now what they are doing. They rearrange their schedules and also rearrange where the meat is going because they know we are following them with our cameras. So they are trying to hide their "tradition and culture." Once we complete our Livestream for the day we review all our footage, which includes photos, video, Livestream archives, and post updates to our social media and websites. Sometimes our days don't end until 9 or 10 pm. And then we do it all over again. Today it's almost midnight and I am taking media calls almost until 4 am. How much harassment are you experiencing and how hard is it to get to the vantage points that your are using to monitor the hunt? I wouldn't say we are harassed because we are monitored by police 24 hours a day. We have riot police with us, Taiji city police, state police, and Coast Guard, all following us. With all the media attention their numbers have increased. When our numbers of volunteers increases their numbers increases as well. So today we had about 30 police following us. The vantage points are very difficult because we are very limited due to restricted areas, due to barricades, due to blocked entrances, due to tarps that are put up to hide what is happening, either at the cove, or at the fishermen's union, or with the meat buyers, They've since put up tarps at Taiji Dolphin Base because that was the only public captive facility that we were were able to monitor, and document the treatment of the dolphins, monitor the training, and the feeding times. And they have since put up a tarp because they don't want us to monitor that. Exactly. We are always trying to stay one step ahead of them. We Livestream up above a tsunami evacuation point, which is a park up on top of a hill. But our vantage point is very limited by trees and shrubbery. The killers now know our vantage point and what we are experiencing is police and Taiji town officials standing up there and monitoring what we are filming and notifying the killers. And now the killers move behind trees or to [positions] where we can't use our cameras or shoot Livestream. So it's about moving to different viewpoints or locations. We are noticing that they are trying to take those away one by one. Last weekend's bottlenose hunt was the largest drive. Has the media attention been dramatically different to what you've seen before? Absolutely. This was the most media that we've had, probably since our Cove Guardian campaign began four years ago. That must mean you feel like you are having an impact, that what you are doing is translating into something important. Absolutely. We're seeing our footage, our Livestream, our Cove Guardians being interviewed. It's definitely causing a worldwide impact. We've seen celebrities tweeting and using social media to speak out. We've seen Caroline Kennedy make a huge statement on Twitter, and that has drawn even more media attention. Yet the hunt continues. Have you wondered before about whether you are making progress? This campaign is a marathon, it's not a sprint. Hence the name Operation Infinite Patience. It's a gradual change that we've seen. We've seen more Japanese locals come forward and more Japanese citizens speak out against the slaughter. They've had protests in Tokyo. And we've seen local Japanese activists come to Taiji and document the slaughter themselves. And that has been a big change since I've been here over three years. What happened over the weekend was amazing. Yes, it was the largest pod. And, yes, an albino calf was taken captive. And it was the combination of those two things, plus social media... it was just a frenzy. I don't even know how to describe it. I would have to say it was very rewarding because it actually shows that all the hard work that is put into this every day is really becoming mainstream. I guess the big question is, whether three weeks from now, the world will still be paying attention. How does your team feel about that? Of course I hope that it's just building the momentum and we are keeping that going and letting people know that this is not going to end, that it's not just a one time thing. The season ends beginning of March, but it will start up again next September. We've had hundreds and hundreds of applications to join the campaign. People want to be apart of it. They want to come here and do their part. Do you feel like the Taiji fishermen made a mistake by taking such a big group of dolphins? I don't think they are going to stop because of the media pressure. if anything, they are going to prove to the world that they are still going to do it. Today they went out there and drove in another pod of striped dolphins and killed 28 dolphins. That's them proving they are not going to stop. We saw them drive in this smaller pod. And whether it is a smaller pod, or striped dolphins, it is still just as important as the 250 bottlenose dolphins. They slaughtered these dolphins. None of them will survive, none of them were spared. They were all slaughtered for human consumption. Whether or not they are being taken captive and sold for millions of dollars, this pod is just as important. And we'll keep the pressure on. We are not going anywhere until they end the slaughter.